Managing Disputes over Wills and Inheritance provides an authoritative, insider's perspective on best practices for advising clients during the often emotionally charged process of distributing a deceased's assets. 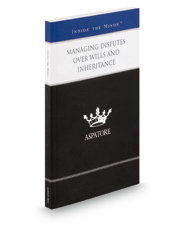 Written by partners from some of the nation's leading law firms, this book guides the reader through the most common disputes, including unequal division of assets, disinheritance, multiple-marriage scenarios, children from a prior marriage, and the asset titling and beneficiary designations for non-probate assets. With an understanding and appreciation for the unique and fact-specific nature of these cases, these top lawyers reveal their proven methods for assisting clients with effective estate planning strategies that mitigate ambiguity and calmly guiding beneficiary clients through the probate process. Additionally, these leaders also discuss the importance of preparing for and participating in a Will contest hearing. The different niches represented and the breadth of perspectives presented enable readers to get inside some of the great legal minds of today, as these experienced lawyers offer up their thoughts on the keys to success within this complex field.